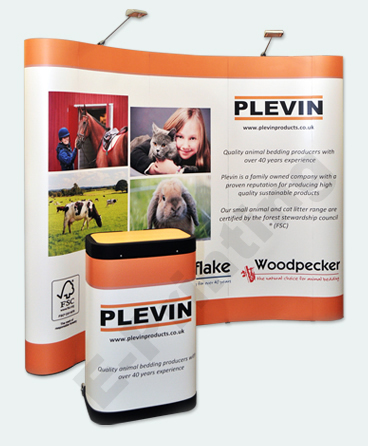 Curved Pop Up Exhibition Displays from only £439! With magnetic bars and counter included! 3 working days delivery available! We sell the best pop up displays for ease of use, value for money and durability. We sell exhibition displays and trade show systems at low, low prices so you can be rest assured you are getting the best quality system at guaranteed lowest prices. Our pop up display stands and frames are backed by our guarantee offering trade show portable display with graphics to give that WOW factor! Our Curved displays fit nicely into any exhibition or trade booth at any type of events, they are great for marketing your services and goods to the general public. With our professional looking graphics this gives a defined look and clarity to your display and with the optical illusion of the curved body this gives a more 3D effect to impress your audience. Why not use E-Printing Services to PROMOTE your Brand Image today! 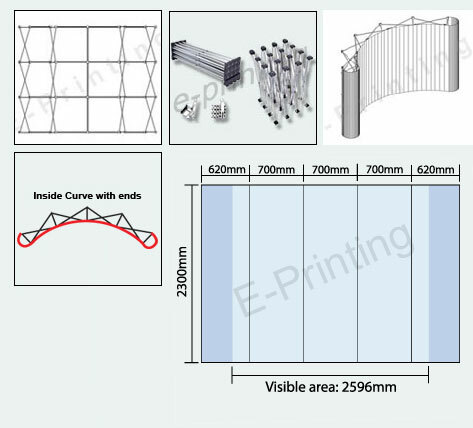 The Display Desk Graphics and Spot lights are additional features, and can be purchased as separate items, we also offer a 3 working day Delivery Turnaround Express Service. Other type or amount, please click here to get free quote. Transit case that could be used as a counter.